Can NBC Own the Intangibles? Law.com is reporting that Conan O’Brien will have to give up the intellectual property rights in the characters and recurring skits that he developed during his NBC career. It’s not all entirely clear who owns what and who’s giving up what. The New York Times reports NBC claims to be co-owner of Triumph the Insult Comic Dog with former writer Robert Smigel; The Hollywood Reporter says Smigel’s reps aren’t talking. 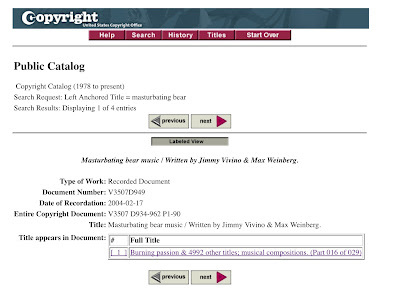 The Smoking Gun reports that some of the music is “safe” because drummer Max Weinberg and guitarist Jimmy Vivino registered the copyright in it, but that’s not at all apparent from the database records – all that they show is that there is some document on record at the Copyright Office between NBC (and others) and EMI that involves 4993 titles, including four musical pieces for the Masturbating Bear and three for Pimpbot. Because television a collaborative business it’s a messy problem. But even once it gets straightened out, what will NBC really own? Everyone seems to be in agreement that the goal is to prevent Conan O’Brien from using the bits elsewhere, not that NBC is going to exploit them itself. It couldn’t; the characters and skits would be only an unfunny imitation without Conan. Everyone is also in agreement that it’s trivially easy for Conan O’Brien to take the same comedic concepts and apply them in a context different enough to avoid infringement. They won’t have the same titles and character names, but they will nevertheless be similar because they come from Conan’s unique sense of humor. Humor is one intangible property that can’t be assigned.